This book is a great book if you like fantasy, villains, and a book that you will enjoy! Also in this book William Everett is not close to normal, witnessing a murder, and being chased by the person, for a strange reason, read this book and find out why! This book is fantasy. Longtime fans of Kidsmomo are well aware that I’m a super scaredy cat. If I watch a horror movie, I get nightmares. If I so much as accidentally glance at a frightening moment on TV while I’m flipping through the channels, it means I’ll get super freaked out when I go to bed at night. And if I’m in the middle of a creepy book, then I’d be wise not to read it after dark! Turns out The Boundless is one of those books. I guess I should have known because it’s written by Kenneth Oppel, the author of the Apprenticeship of Victor Frankenstein series (for ages 12 and up). I’ve deliberately stayed away from his Frankenstein books, but for some reason, I thought The Boundless would be more of a light-hearted mystery. Fail. Except it wasn’t really a fail at all because I really enjoyed the book! It’s a steampunk adventure set on a train as it makes its transcontinental journey across the wilds of Canada. But the train is no ordinary locomotive; it’s incredibly long — like a moving city — and this is its maiden voyage. Will’s father is the manager, so they have first-class tickets. But Will lingers outside too long during a stop, and he witnesses a murder, then must seek refuge at the back of the train where he has no ticket to identify him. But soon it becomes clear that it would be better NOT to be recognized because the killer is looking for him — and he’s got a whole team of brakemen along the length of the train working on a heist. AND they’re not afraid to kill Will to keep him quiet. You may be thinking that’s not very frightening. Fine, you have a higher threshold for tense situations than I do. But what would you say about Sasquatches and a supernatural hag lady who controls your mind? Because I, for one, find them creepy and they also play a part in the book. Also, there are circus people. But surprisingly, although some of them are a bit freaky, none of them are scary. In fact, they help Will as he tries to reach his father. 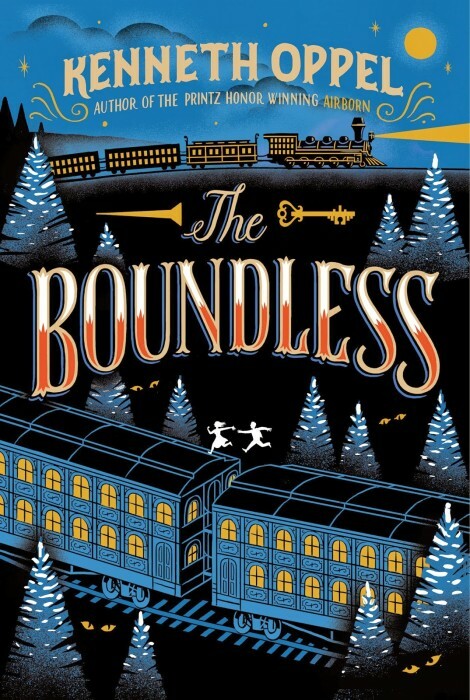 If you’re interested in a dark, action-packed, thrilling tale, then you should definitely check out The Boundless. Somehow it manages to be both quiet and gripping at the same time, and despite all the scary bits, there are also moments of humor and brightness and happiness and hope. If you’ve already read the book, leave a comment and tell me your thoughts! Did you have to avoid reading it at night like I did? Karen has never taken an overnight train trip, but she thinks it probably wouldn’t be that comfortable. However, if she could ride on the Polar Express, she would jump at the chance!